The image of standing on the desk brings the image of John Keating (Robin Williams) standing on his desk at Welton Academy (Dead Poets Society) to get his students to all look at things with a different or new perspective. Be it a teacher, coach, social worker, parent, care-giver, foster parent, mentor, adviser that focus on making "strong children," this blog will just share ideas and inspiration to all those who care about kids and making the world better. The image also reminds me of Herbert Gower (Robert Mulligan) in the movie Teachers. He was a mental out-patient who answers a phone to become a substitute teacher. He takes over a history class. He comes in dressed as different people from the past, including George Washington. 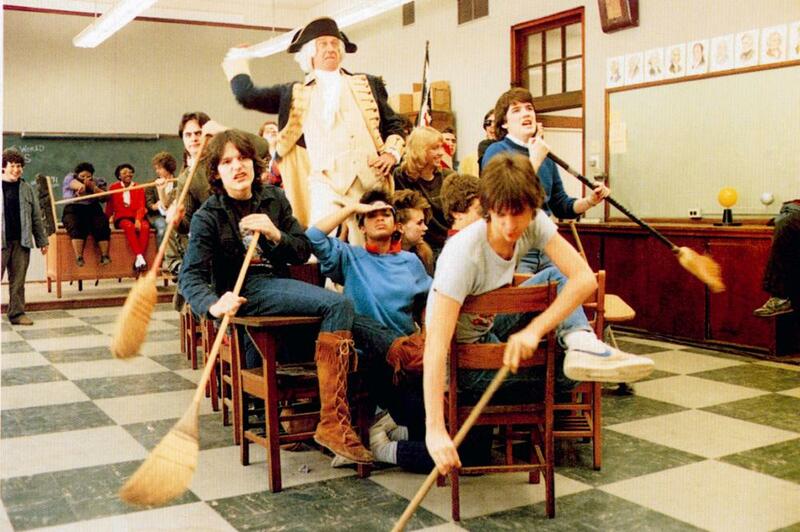 He has the class on desks crossing the Delaware. Later on in the film, it does suggest one needs to be a little crazy. And in Here Comes the Boom, teacher Scott Voss (Kevin James) livens up his science class by standing on the desk. Talk about a little crazy, Scott gets into MMA fighting to raise funds for the music program. Hmm. Standing on the desk does remind of being a kid and climbing on the furniture, trying not to touch the floor as we played Hot Lava or Sharks. Oh, that may be how we feel some days too, stranded and surrounded, but I digress. Back at the desk. This blog: perspective, motivation, thoughts, and some humor. I hope to bring these to you and more.